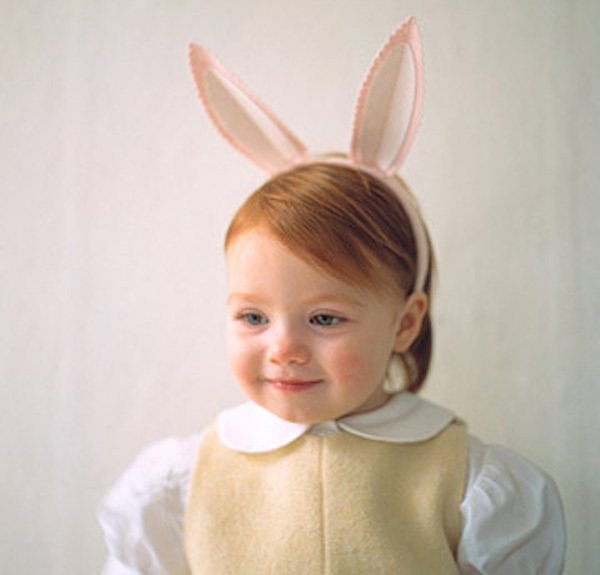 The Babyology guide to DIY Easter crafts! We’ve scoured the internet for all sorts of fun Easter craft activities that anyone can do, so if you’re ready to get your egg-themed craft on, click on through! 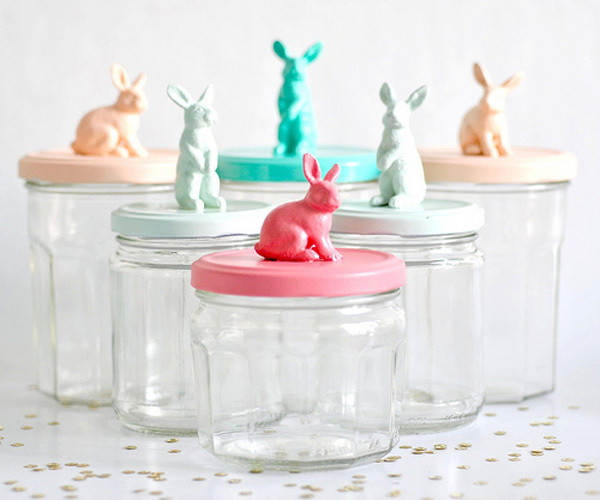 A craft activity that’s made it to my own list of things to try are these sublime Bunny Jars (pictured above) from Torie Jayne. Torie’s colours are perfect for Easter and I figure they can be used for my daughter’s bobby pins,hair ties and other treasures long after the holiday. Find out exactly what you need to do over at Torie Jayne blog. 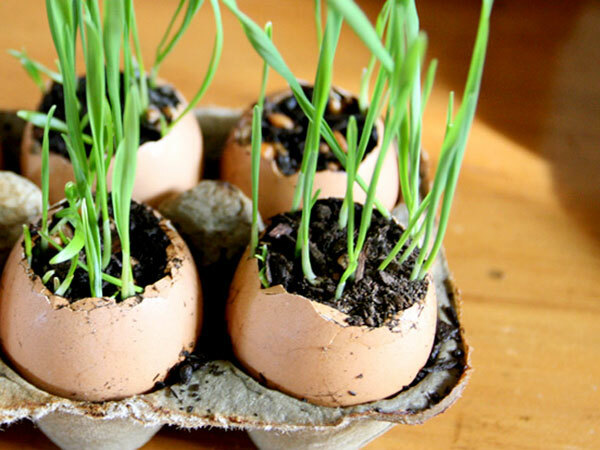 Kids will love getting their hands a little dirty with this Wheat Grass Eggs activity. The clever crew over at Mumtastic show us just how to make these grassy gems. You could fill each with a different herb seed and watch them grow over the Easter break. 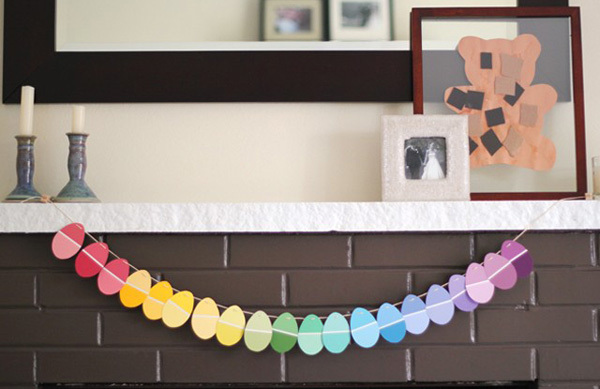 Every celebration naturally calls for a garland and you can’t beat the simplicity of this DIY Paint Chip Easter Garland (above) from Modern Parents Messy Kids. For something a little trickier, try this one with its typography edge on egg shells. You can find the tutorial at Skip To My Lou. Toddlers will adore the cuteness of the Baby Chick craft activity and I don’t doubt they will want to make more than one! Why not add a magnet strip to the back and attach to the fridge?! Find out exactly what to do over at the delightful Simple As That blog. 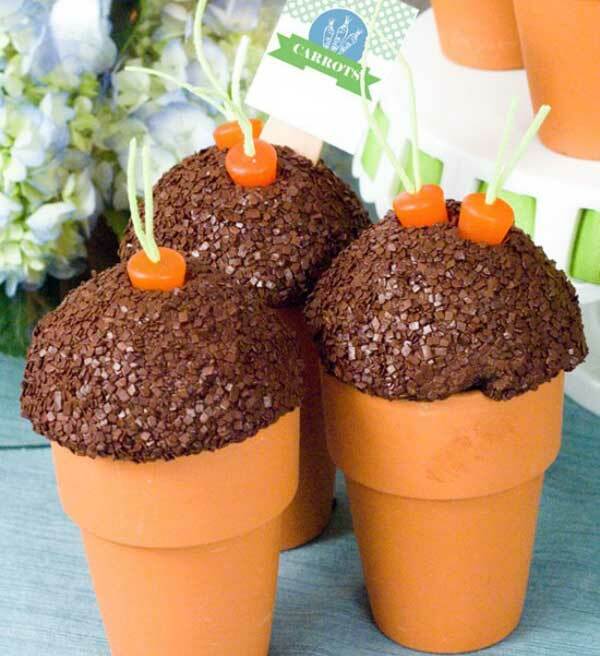 Get busy in the kitchen preparing the most awesome of Easter edible treats with these Carrot Top Cupcakes from One Charming Party – though I suspect adults couldn’t bear to bite into such prettiness, little ones will have to be held back from tucking in straight away! 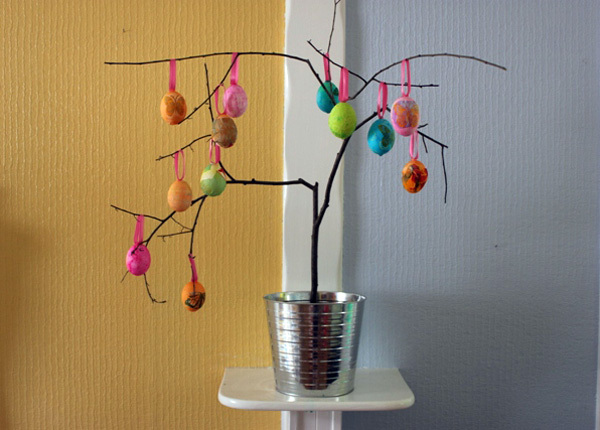 A super easy craft is to make your own Easter Egg Tree. Simply collect some fine branches and arrange them in a vase, bucket or jug and let the children decorate with their school crafts or decorated polystyrene eggs. This beauty here can be seen over at Artful Parent. We can’t help but turn to Martha Stewart for child-friendly crafts and a couple of stand outs are these adorable Bunny Ears and fantastic Egg Chickens. 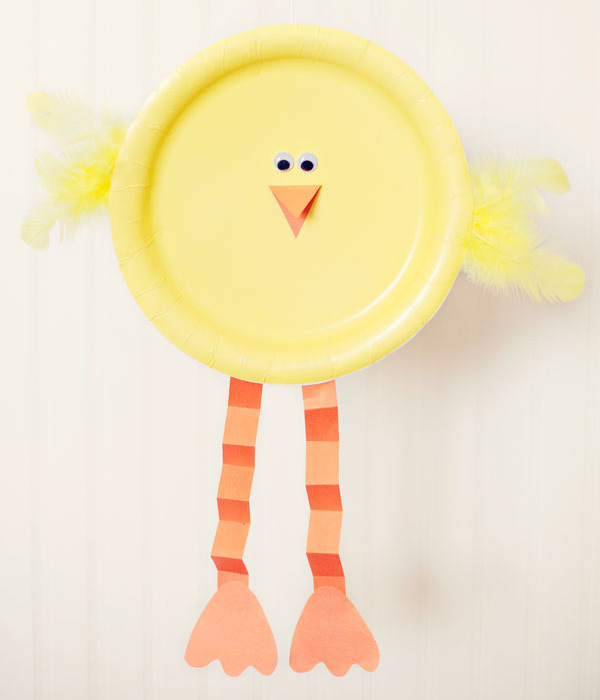 Easter crafts can’t possibly get much cuter than this Funky Chicken, designed by Dondi Richardson. Imagine a line up of these on a mantle – gorgeous! You can find the tutorial over at Make it: Fun. 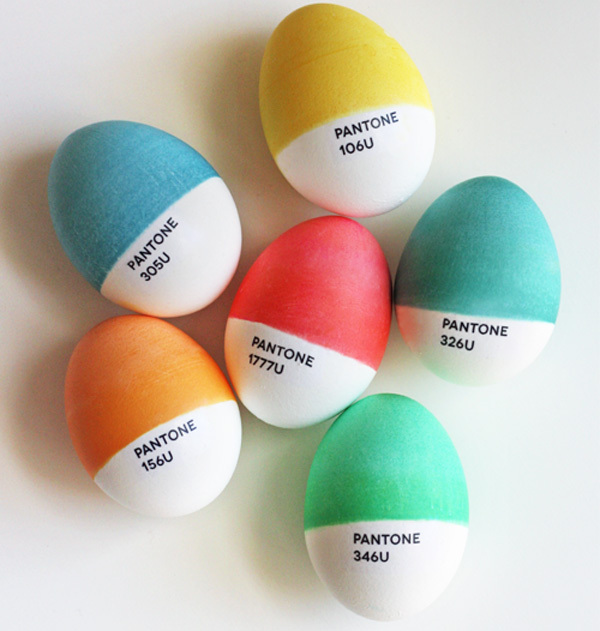 Something I’d like to try myself, which I’m sure my slightly older children can tackle too under my watchful eye, are these DIY Pantone Easter Eggs using the how-to guide from How About Orange. We hope we’ve inspired you to exercise your artistic elbow and get crafty! We’d love to hear what Easter craft traditions you have in your home, please feel free to share them in the Post a Comment section below.